These accessories allow locks and latches to be implemented effectively on rebated doors, resulting in a smooth double opening mechanism. If you have doors of this nature, our selection of fixtures and fittings won’t let you down; designed for a variety of shapes and sizes, you’re sure to find something that suits your needs. We carry a sizable catalogue of mortice deadlocks and mortice sashlocks if you desire a locking mechanism, and our specialised mortice bathroom locks provide a more domestic alternative while maintaining ease of use and reliability. We also cover more industrial lock demands with our choice of budget locks, fire brigade locks and padlocks. Typically used in settings where tensile strength is necessary, these weighty fixtures can be applied outdoors without concern and provide a staunch defense to your heavier assets. 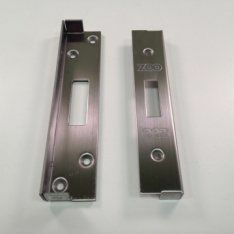 In case you require a more home oriented option, the rim locks & night latches we stock offer a combination of versatility and simplicity in a refined form. Popular with newer properties, these locks are easily installed and are paired with smaller, sleeker keys. For those with less common door types, consider browsing our collection of sliding door locks and latches. Designed to fit squarely into even the most creative of doors, you’re sure to find a design that meets your needs.